Hope everyone had a great weekend! 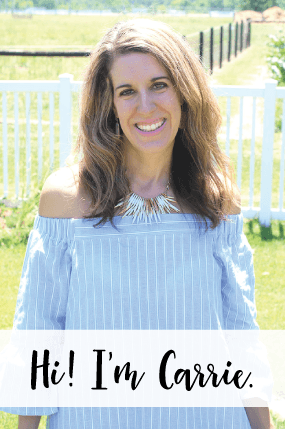 I was able to participate in the Pinterest party at Michaels this weekend and met the host, Jill from Create Craft Love and another fellow blogger that practically lives in my back yard, Cheryl from That’s What Che Said. It was fun to meet some local STL bloggers and I did a little craft shopping for Christmas, too! I even got Autumn one of those rainbow loom bracelet/ring makers for Christmas.They seem to be pretty hot right now and she loooves crafty stuff and jewelry, so I think it’ll be right up her alley. I also did a little cooking this weekend… I’ve decided I want to start working on a freezer stash so that I have meals I can pull out on busy nights. I plan to do this regularly and will be sharing one freezer meal every second Monday of the month with you. I was thinking it would be fun to turn it into a link up party next month, if there is interest. Please comment below or send me a message if you would be interested in participating or hosting it with me. It could be old freezer recipes you have already blogged about or new ones. 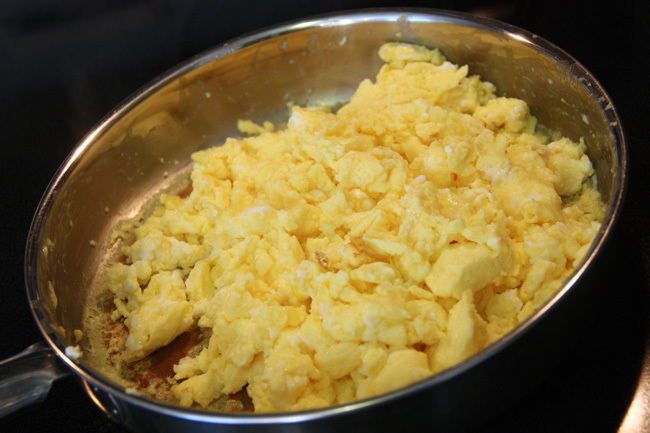 Today I am going to share a freezer recipe I saw on another blog that I KNEW I had to try. 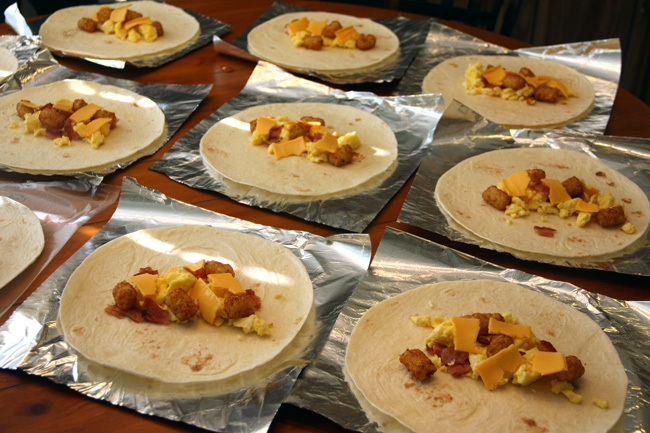 Breakfast burritos, a recipe I found on Hello Newlywed Life. She made hers with ham and bell peppers, mine are with bacon and no peppers (gotta please my picky kids!). 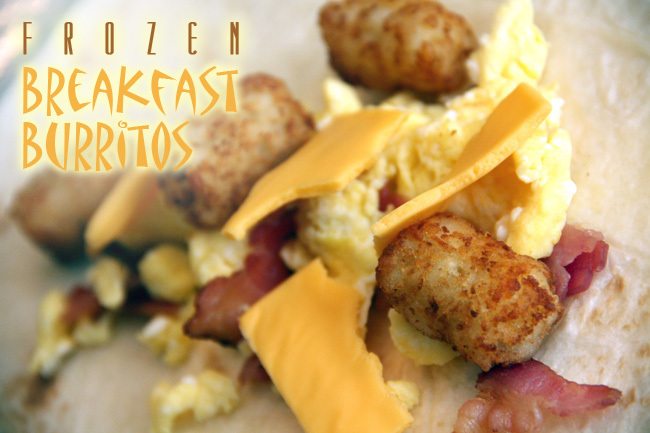 The ingredients are pretty simple: 1/4 cup of milk, Velvetta cheese slices, box of microwave bacon, tortillas, 12 eggs and frozen tator tots. 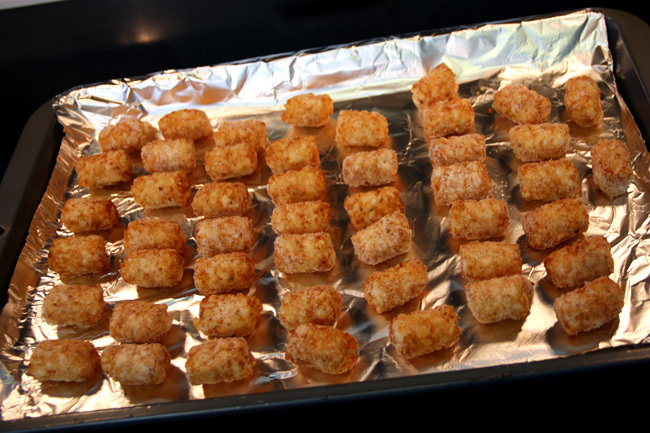 First you will want to bake 48 tator tots (it is about half the bag). 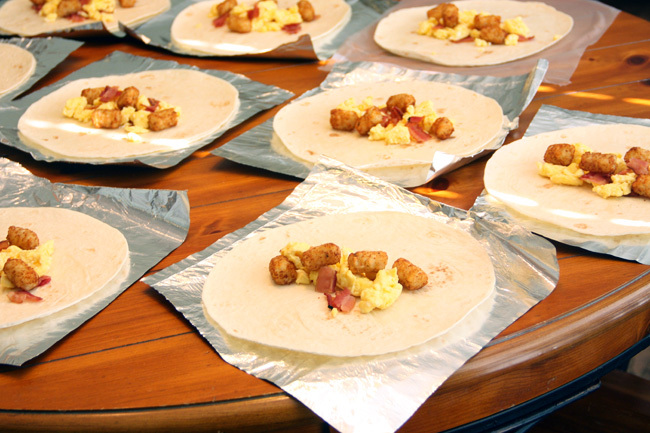 Each burrito will have 4 tator tots each. 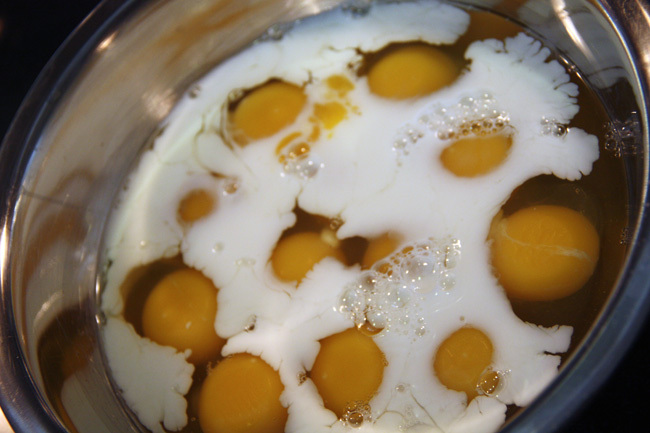 Next, crack open all 12 eggs and mix them up with the 1/4 cup of milk and a pinch of salt. Before my husband, I had never made bacon in the microwave. Boy, was I missing out. 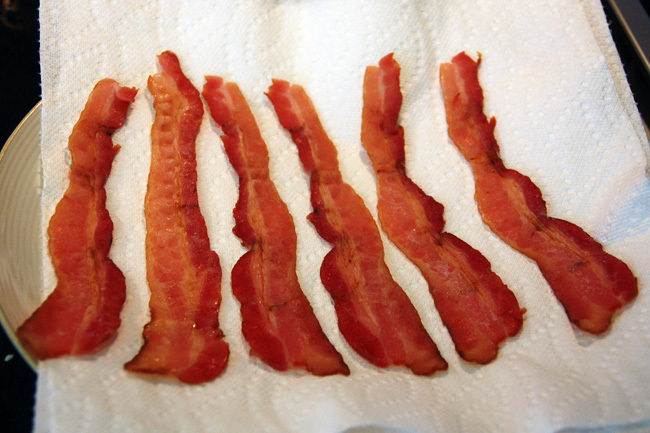 It is my favorite bacon now and it is SO quick! You put two paper towels down, 6 pieces of bacon and nuke it for 25 seconds. Then, you do it again and you have enough bacon for all of your burritos. 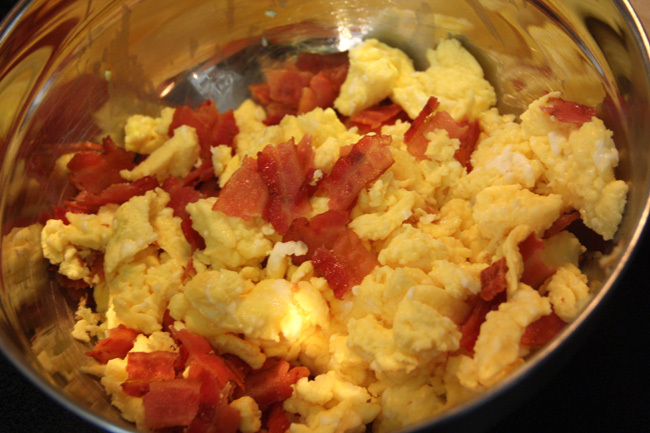 Tear the bacon up and mix it in the scrambled eggs. 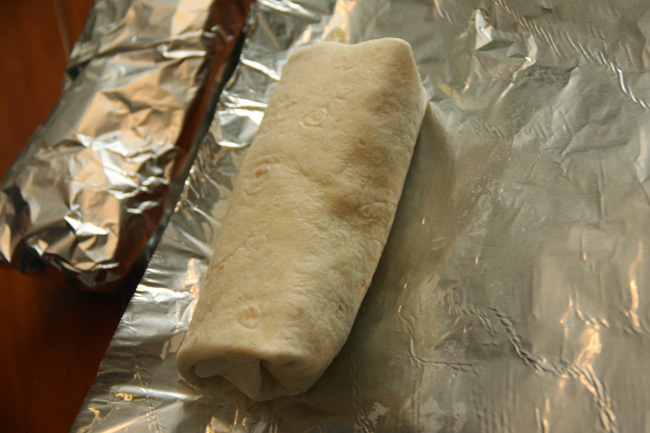 Then, rip of a piece of foil and place a tortilla on it until you have 12 of these on your kitchen table. 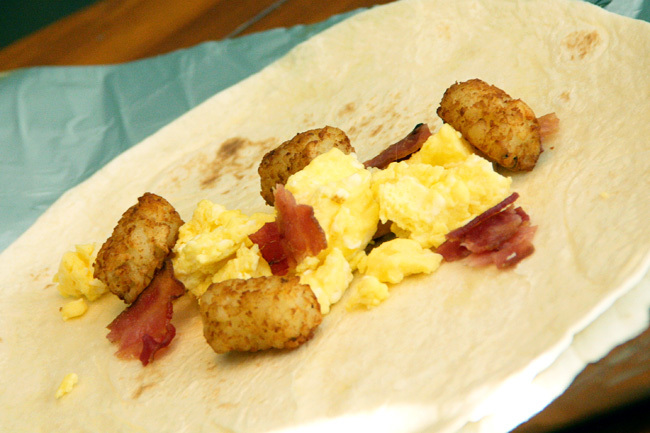 Then the fun begins, start layering each burrito with the eggs/bacon mixture and 4 tator tots. YUM! 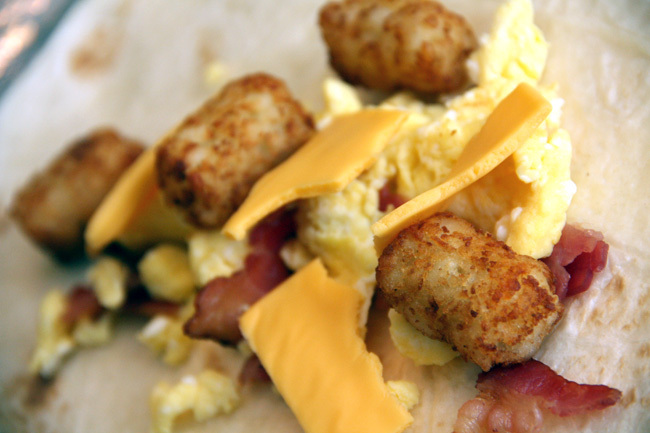 Then, to make it even better… take half a slice of Velveeta cheese and rip off pieces and layer over the burrito. Seriously, this is looking good, isn’t it? 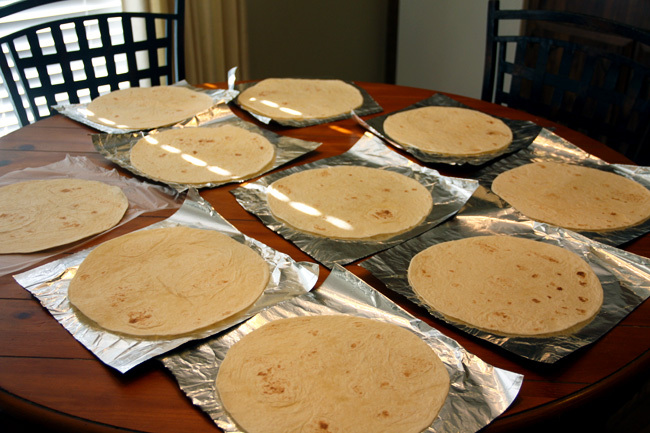 And, there you go… 12 burritos ready for some wrapping!! Since my husband is such an excellent burrito wrapper, I let him wrap all of them. Yes, I love him. And, yes I decided to nuke one and try it right on the spot! These are REALLY good, you must try them! I can’t wait to pop one in the microwave one morning this week! And, I am hoping the kids love them, too! When you are reading to eat one from the freezer, take the foil off and nuke it for 1.5 minutes, flipping it over after half of the time. So, are you going to join me next month? 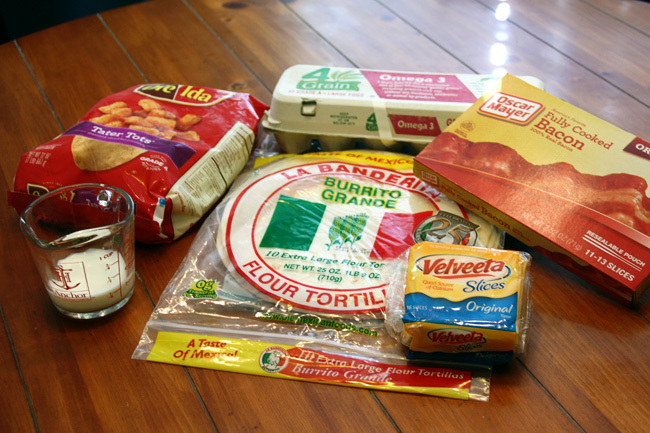 Do you have an excellent freezer recipe to share? I would love to have it! I am trying to decide what I want to make next month, but I am thinking I will stick to breakfast and try a quiche recipe that will freeze well!